Unable to generate keywords / stuck on "Fetching Keywords"
What can I do if its stuck on “Fetching keywords”? Long Tail Pro integrates with the Google Keyword Planner to generate keyword ideas and keyword volumes. Because of this integration, you need to sign into a Google Adwords account in order to find keywords with the software. If you’re having trouble fetching keywords or it seems like the software is “stuck”, most of the time this means that something has gone wrong with the integration with Google. For instance, the issue could be that you're not logged into Google, a catpcha is required, or that Google is rate limiting your requests. 1. Start a NEW Project by clicking the Blue “+” sign in the top-left corner, put in a project name, and click on 'Create Project'. We always recommend starting a new Project. 2. Once you've created a new project, the 'Find Keyword' box should open up automatically. If it does not, click 'Find Keywords'. Once you have the 'Find Keyword' box open, add at least one seed keyword under "Add Seed Keywords". 3. Hit “Generate Keywords & Fetch Data”, and login to Google Adwords when prompted (Long Tail Pro will not work if you don't have an English Google Adwords Account). Make sure to check the box to remember your login for next time, so you won’t have to sign in again. 4. If it doesn’t work, click on the gear icon in the top right, then select 'Show Debug Panel'. This will allow you to see what's going on underneath the hood of Long Tail Pro. 5. You click "Remind me later" if you see a message in the debug window about "using an older web browser". You can safely ignore the message that begins with "There was an error with your operation..." as well - both these messages are expected when using debug window. You can see the two messages were talking about below - these messages do not indicate that there is any issue with LongTailPro. 6. In the debug popup window, please click on “Tools", then click "Keyword Planner” to refresh the Keyword Planner Tool. 7. 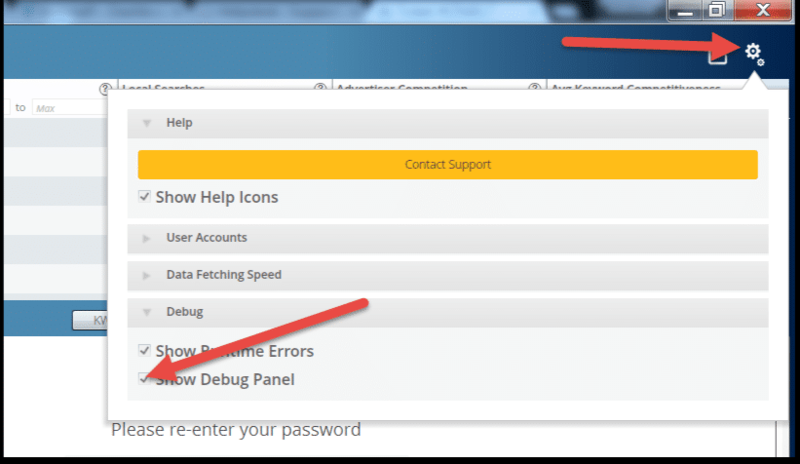 Next, close the Debug Window by unchecking 'Show Debug Panel' that we selected earlier. Click "Find Keywords" again, add a new seed keyword, and click "Generate Keywords and Fetch Data" to run the process again.Go back to the “Find Keywords” button, add a new seed keyword and click “Generate Keywords & Fetch Data” to run the process again. In many cases, this process of 'refreshing' the Google Keyword Planner should resolve the issue. 8. If you're still having issues with Long Tail Pro not being able to fetch keywords, take a screenshot of with the 'Show Debug Panel' box open, and send it to us at support@longtailpro.com. Your screenshot should look something like this, but you may have a different message along the top of the debug window - our support team will take a look at this message and figure out how to resolve the issue for you.